Clouds part and moonlight steals through my curtains, a silver intruder. I sit upright in bed and the gunis clasped in my right hand. I have been in the same position all night; the pillow is rucked against my back and there is a pan in my neck. My hand aches from gripping the gun’s handle too hard. I have not slept, though I tried at first. Jamie is a maths whiz. His older sister Summerlee is rebellious and his younger sister Phoebe is loved by everyone. When Summerlee wins the lottery on her eighteenth birthday her rebelliousness goes up a notch – she no longer needs her family, so she’s out of there. Soon she and her boyfriend Spider are living it up with parties, drugs and alcohol, while the rest of the family carry on as best they can, until Phoebe is kidnapped, by someone who wants 2 million dollars to give her back. Right from the start it is Jamie the kidnapper communicates with, and as Jamie was with Phoebe when she was taken, he decides it is up to him to get her back, using game theory. He needs to outsmart the kidnapper, predict his or her moves – and not be predictable himself. 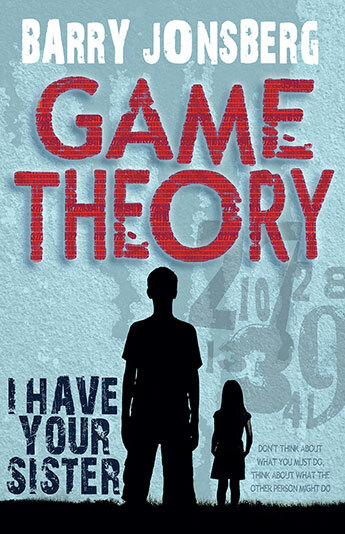 Game Theory is an exciting young adult psychological thriller for teen readers. There are plenty of clues and leads encouraging readers to try to figure out who the kidnapper is, and a prologue which foreshadows the third (and last) section of the book, as Jamie attempts to get Phoebe back. Jamie is a likeable main character – aware of his own strengths and weaknesses, humorous and also brave when needed, even though he shows his fear and worries for his sister. Jonsberg has written in a variety of genres for the young adult readership. Game Theory is a new direction and will not disappoint.